Luxman P-750u is a meticulously refined evolution of the P-700u, a highly respected, industry standard, high-end headphone amplifier revered by many headphone listeners. 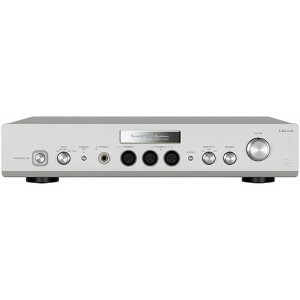 Luxman P-750u perfectly balanced headphone amplifier features LECUA high fidelity computer controlled attenuator, ODNF Version 4.0 and patented feedback circuit. The addition of a 4-pin XLR balanced headphone output completes the evolution by extending the choice of compatible headphones and elevating the listening experience for even the most ardent headphone users to uncharted heights. LUXMAN’s ODNF original amplification feedback circuit achieves a high-speed primary slew rate, ultra-wide bandwidth and low-level distortion by feeding back only the distorted elements of the audio signal from the output amplification circuit. The design of the P-750u has resulted in even lower output impedance and a higher signal-to-noise ratio, due to a paralleled first stage and a Darlington-equipped second stage amplification circuit. The P-750u features the very latest version of ODNF, Version 4.0, offering improved accuracy in detecting distortion by using a triple-paralleled input stage error detection circuit. The expression of emotion and the power of silence are thereby enhanced by accurately reproducing even the lowest level audio signals, whilst preserving the dynamic and fresh nature of the sound. The final stage of the P-750u's ODNF-equipped amplifier circuitry is a 4 channel, fully balanced output system. A Bridge Tied Load (BTL) output configuration is used for balanced headphones whilst a dual-paralleled configuration is used for unbalanced headphones, demonstrating the suitability of the P-750u for all kinds of headphones. During headphone playback, audio signals are instantaneously delivered to both ears. Issues caused by level deviation between left and right channels at low sound volumes or differences in sound quality over the volume range are difficult to solve using a conventional analog volume adjustment system. The design of the P-750u features a solid state (IC) circuit, achieving a significant reduction in size, together with the LECUA (Luxman Electronically Controlled Ultimate Attenuator) which Luxman believe is the ideal level control system. The incredibly smooth volume control operation of the P-750u minimizes level deviation between the left and right channels at low volume and eliminates loss of sound quality at any volume setting. This multifunctional amplifier suppresses the deterioration of sound quality by offering three selectable levels of sensitivity, depending on the impedance and efficiency of the headphones, and by integrating left/right balance adjustment with LECUA. The P-750u is equipped with ODNF Version 4.0, the latest generation of LUXMAN’s original high sound quality amplification feedback circuit on each of the four identical output channels. Utilising a BTL balanced output configuration enables a great improvement in left-right separation, sound localisation and power supply regulation, whilst cross-modulation distortion is also significantly reduced. The listener can enjoy the maximum benefits of balanced connection headphones. When using unbalanced headphones, the four channel amplification circuitry is divided into 2 channels each for left and right, driving each in parallel, thereby doubling the output current supply capacity. This improves absolute driving force and intensifies sound reproduction with dynamic intonation. An enhanced sound stage can be enjoyed with a rich range and the superb detail that is characteristic of a balanced connection whilst maximising the performance of the headphones. The P-750u features a choice of headphone outputs including a standard stereo jack (unbalanced) output terminal, a stereo pair of balanced 3-pin XLR terminals with the addition of a 4-pin XLR balanced terminal for compatibility with high-end headphones. The design of the P-750u is enhanced further with the inclusion of a highly stable power supply circuit consisting of a highly regulated OI-core power transformer, two 10,000μF custom block capacitors in the power amplifier stage and two 3,300μF custom block capacitors in the pre-driver stage thus achieving immense power and stability. For smooth, stress-free signal transmission, Luxman's original Beeline construction is utilized. This allows the wiring and signal transmission to take the shortest optimal route (like the homing route of a bee). Non-angled wiring pattern with straight and smoothly curved traces on the circuit board also contribute to the smooth passage of audio signals. In addition to the 3-step sensitivity selection, allowing the output sensitivity to be chosen according to various headphones, the P-750u also features a left-right balance adjustment control. Both functions are controlled by LECUA, a high-quality computerized attenuator, to minimize the deterioration of sound quality over the volume control range. The dual design of the base chassis, constructed from 3mm sheet steel, maximises rigidity and makes the centre of gravity lower. A mirrored, rhodium plated logo plate on the front panel combines beautifully with the blaster white metallic cabinet for a truly refined finish. Gradation cast iron legs that are used for the Luxman 900 series separate amplifier have been customised for the P-750u, taking thorough countermeasures against vibration.